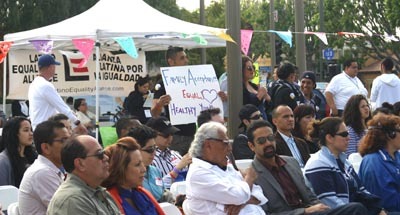 Youth, Families and Community Services held at Mariachi Plaza in the predominately Latino community of Boyle Heights. Being a transgender youth in Mexico was a struggle, Hernandez said. Not having any support from his family, he wound up depressed and homeless, and nearly died after suddenly stopping the hormone therapy that would have allowed him to live as a woman, the Boyle Heights resident and Garfield Adult School student told EGP. While his story was not part of the formal program or spoken from the stage, Hernandez’ experience is not untypical of the experiences Lesbian, Gay, Bisexual, Transgender and Queer (LGBTQ) youth experience everyday in the eastside community and all across the country. The April 6 forum, held in a very public place, was intended to empower LGBTQ people of color – people like José Hernandez – and to expose and educate Boyle Height’s large immigrant population to LGBTQ issues. It was also about respect and shedding the notions of acceptance from the past. Stop being “decorative gays,” challenged Queen Victoria Elizabeth Ortega, a poised 33-year-old transgender Boyle Heights resident and LGBTQ activist dressed in a business suit and pumps and speaking from the stage at Mariachi Plaza. “Lets challenge our service organizations, lets challenge our families… we have to do it with respeto (respect)…” to lessen the suffering caused by discrimination, especially among the youth, Ortega urged the more than 100 people in attendance. During the opening ceremony, speakers addressed the serious issues of bullying, suicide, discrimination and being forced to live as outcasts due to sexual orientation. Participants were encouraged to become agents of change and to raise the discourse bar from putting up with being “tolerated” to receiving “respect”. “Today inspires the vision, a heartfelt hope that I and all the other LGBT members and people like me will be able to walk to dinner in Boyle Heights or any community in which we live, holding the hand of our wife or husband, accompanied by our children and to feel safe and be an integral part of our community… We hope you can share this vision with us,” said Ari Gutierrez, chairwoman of the Latino Equality Alliance, an organization established in response to Proposition 8, which is now under review by the U.S. Supreme Court. Gutierrez said the forum was the first time an openly gay event has been held in Boyle Heights and it was the first time the community had been brought together to talk about the safety and health of Lesbian Gay Bisexual Transgender and Queer identifying youth. Growing up, Queen Victoria Elizabeth Ortega lived in the Wyvernwood apartments. She told the audience that she’s been discriminated against and harassed, and regularly called names when she jogs around the Evergreen Cemetery jogging path. “We need to claim our space, we need to make this happen for ourselves,” Ortega said. Born the only ‘male’ child in her family, she felt pressured to carry on the family’s name and “seed”. It took about six years and her mother’s death to get where she is today, and to have her father’s support. “[My mother’s passing] allowed me and my father to have that uncomfortable silence that is needed; there will be uncomfortable silence today… I challenge you to work through it, that is what this space is needed for,” Ortega said. Her father, 71-year-old Adrian, said he was immediately ostracized by family and friends when he began to support his daughter, but he could not turn his back on his “Vicky Lou” (his pet name for his daughter), he told EGP. The pressure and humiliation can take its toll on families but its harder on the youth. According to the event organizers, LGBTQ youth, especially minorities, face issues of bullying at home, in school and in the community which often leads to family separation, homelessness, high-risk health behavior that can expose them to HIV/AIDS and an early death. In addition, LGBT students are 1.4 times more likely to be suspended than their straight peers, organizers said. White House LGBTQ Liaison, Gautam Raghavan, said that many victims of hate crimes nationwide are disproportionately minority, LGBT people. He said the Obama Administration has adopted policy changes to help protect and ensure equitable treatment for LGBT persons. “I hope that if you take something with you from me being here today, I hope its the knowledge that the President of the United States, The White House and the entire administration are with you every step of the way,” he said, encouraging attendees to be advocates for LGBT equality. The time has come to evolve beyond just being tolerated, according to LAPD Assistant Chief Sandy Jo MacArthur. While the LAPD and society have made some advances since she joined the police department in 1980, MacArthur said being “tolerant” of LGBTQ persons is not enough. MacArthur said it is very important for the LAPD to respect everyone, regardless of where you’re from, who you love or what country you come from. “Change is about education. One of the best way to bring about change is to talk about the stories, how each one of you has been impacted by things in society that are just not right,” she said. When Univision Reporter Norma Roque’s brother came out of the closet, most of her family still embraced him, she told the audience in Spanish. What will the LGBTQ community’s narrative be in the future, questioned Diego Sepulveda, a queer undocumented youth from South Los Angeles. “Sometimes people reject us, they see us as monsters. We are not monsters,” said 25-year-old José Hernandez last Saturday during the LGBTQ Forum for Youth, Families and Community Services held at Mariachi Plaza in the predominately Latino community of Boyle Heights.